Water, employment and migration crises are posing rising risks globally. 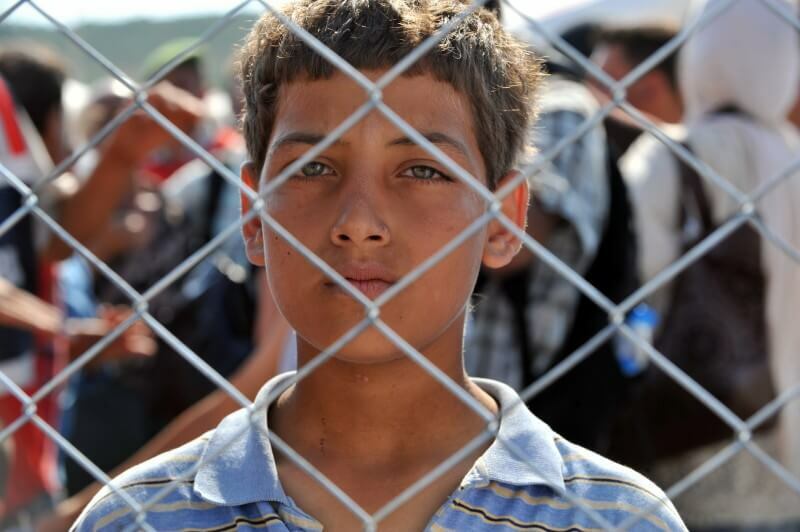 In parts of the Mediterranean, the situation on all three crises is alarming. Their link may not be obvious at a first glance, but it is becoming increasingly evident based on the hard evidence of realities on the ground. Exploring their causal relationships will provide a better understanding on how to tackle some of the greatest global challenges and help to effectively work towards the fulfillment of the UN Sustainable Development Goals (SDG). In line with SDG #6 on Clean Water and Sanitation and linking with a range of other SDGs, the Global Water Partnership-Mediterranean (GWP-Med) is developing a new program on “Water Security, Migration and Youth Employment” with a focus on the Middle East and North Africa (MENA) region. The goal of this nexus is to turn water insecurity into security; unemployment and under-employment into employability and job creation; and displacements into emigration prevention in countries of origin and integration of migrants in transit and destination countries. Water scarcity in the MENA is acute, hindering development and triggering migration. It threatens human security, and can jeopardize the socio-economic stability across the Mediterranean. Looking back at the lifestyle of nomads who moved across the MENA and beyond to find areas with sufficient water for their tribe, the relation between water and migration is not a new trend for the region. The youth employment crisis is also a long-standing issue for the MENA countries. Recording the highest youth unemployment and under-employment worldwide, with rates ranging between 28-30% per the International Labour Organization (ILO) 2015 report, this crisis can be identified on two levels. Firstly, agricultural areas are challenged due to water pollution, depletion of ground water resources and higher variability in water supply. Farmers, including rural youth, are abandoning their land, driven to the cities by drought, dying livestock and loss of market to find work. But they often face a decrease of their living standards. Approximately 60% of the population in the MENA live in cities, while the urban population is expected to double by 2040. The negative impacts of urbanization on the diversity of the job market and on the dynamism of economic activities in general can undermine the social equilibrium. This situation causes profound dissatisfaction on the grounds of unemployment, and may result in violent outbreaks and eventually to migrant outflow. While water insecurity can trigger an economic downturn, water security could fuel economic growth. Secondly, ineffective education programs that are detached from the market needs result in a mismatch of skills and impede school-to-job transitions: the region presents exceptionally high rates of unemployed youth and a broadly ascribed low employability. This applies especially to many university graduates who find themselves amidst fierce competition over very few jobs. At the same time, qualified workers are missing from the lower-standards labour market. The intensifying water-related risks due to climate variability and change, combined with the rapid population growth, and increase in unemployment, constitute daunting socio-economic perspectives for young people between the ages of 15-29 across the MENA. Young women of all skill levels are in a more disadvantaged position compared to their male counterparts. A triple burden of gender, age and skills mismatches affects the female employment quota, which is significantly lower than the one of their male counterparts. With less than 3% GDP increase since 2013, according to the World Bank, small economic growth in the MENA countries prevents the absorption of the additional labour supply flooding the market every year, impacting youth and affecting their decision to migrate. Consequently, more than ¼ of the MENA youth intends to either relocate within its own country or emigrate in Europe in hope of a better future. Tunisia is primarily an origin county of migrants. This is because rural livelihoods are reducing due to the increased inter-annual water supply variability, leading to plummeting agricultural income. In response, many young rural residents are drawn to the often deceptively promising city life. This increases the pressures on urban areas, which often struggle already with inadequate infrastructure. Those with the necessary financial means, usually higher skilled individuals, then turn their attention towards Europe and leave the country, leading to the infamous “brain drain”. Lebanon, as a transit and – for some – a destination country for regional migrants, is recording a new high in unemployment while facing a range of water security challenges. With limited rainfall over the past three years and the demographic changes since 2011 due to the influx of Syrian refugees, Lebanon is now suffering from additional water supply and wastewater treatment demands. moderately dependent on water. Investments into water can secure existing jobs and generate new ones through economic trickle-down effects. For example, if the MENA countries could invest into more sustainable agriculture, through irrigation efficiency or rainwater harvesting, they could generate a multitude of direct on-farm employment and indirect jobs. According to the Arab Forum for Environment and Development (AFED), such approach in the Arab countries could save up to 5% of the region’s GDP and add 10 million new jobs in the years to come. Investing into wastewater and greywater treatment, flood protection, and other non-conventional water resources, could create additional job opportunities and contribute towards the 50 million jobs needed until 2020 to employ the additional labour supply in the region. Water is directly linked with the region’s economic development as it threatens to lower MENA’s GDP by 6-14% until 2050, if no water-smart policies and technologies are employed in the immediate future. While water insecurity can trigger an economic downturn, water security could fuel economic growth. GWP-Med started exploring the new nexus of Water Security, Youth Employment and Migration, and conducted preliminary case studies in Tunisia and Lebanon as potential pilot countries. 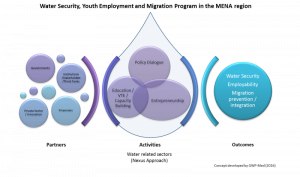 The goal is to select the water-related sectors that present the most opportunities for employability, identify the priority groups in need of employment, and pin-point the kind of water-related training, skills and start-up support needed to match these. In cooperation with governments, international institutions, stakeholder organizations (including youth associations), and financiers (the private sector), GWP-Med and its partners will design vocational and entrepreneurship training programs for youth on Water-Energy-Food-Environment Nexus fields, including with a focus on non-conventional water resources promotion. Special attention will be on addressing low female employment opportunities in the MENA. A central contribution in the development of curricula will be aimed at private sector companies to respond to their needs and requirements. Start-up support structures and mentoring networks in the incubation phase of nascent enterprises, will impart a ‘green-blue mindset’ and ‘green-blue skills’ to the program’s participants, creating new jobs while nurturing a new water culture. To support setting the regional and national institutional and regulatory ground for successful measures, GWP-Med will assist national and regional authorities, to develop strategies to address the root causes of unemployment and migration and effectively contribute to water security in the region. Needs are adamant. Challenges are high. But, solutions are feasible – if vision, partnership and investment come together.